I never really knew what the tradition was for. All I ever remembered was eating 'moon cakes' around this time of year. I never really liked moon cakes. The traditional ones.. are too rich. Too fatty. (They have a lot of larrrrrd). Not delicious in my eyes, as a child. And I still think that way! But with the new types of moon cakes around, such as the snow skin and the mochi ones.. I've found something that I can settle for. So I searched in Kuala Lumpur and Singapore for some moon cake moulds. (There was a slim chance of me finding any in Melbourne. Sigh). But I came back fruitless. I did find some jelly moulds and other kueh moulds, just not proper moon cake ones. :( Luckily for me though... a friend found some in Vietnam for me. Thank you so much A! They were not mini, but they were sufficient enough. Hehe! I'm still on the search for mini moon cake moulds..
Make the custard first. Sift all the dry ingredients. Add the liquid ingredients apart from the butter. Add the melted butter when all is mixed. Steam for 30mins or until cooked. When cool, roll into little balls that resemble egg yolks. For the snow skin, sift all the dry ingredients together. I then split into 3 bowls (as I made 3 different flavours). I add matcha powder to one bowl and yam/taro powder to another bowl. Then split the water into the 3 bowls equally, as with the shortening. Add some vanilla extract to the last bowl. Mix until a dough is formed. If too sticky, add more fried glutinous rice flour until it can be handled. Now you can start making the moon cakes! You should now have a three layered ball (outer snowskin, filling and inner custard 'egg yolk'). Dust it with some fried glutinous rice flour. Dust the mooncake mould as well. Press gently into the mould and carefully remove. And there you go! All you need to do is refrigerate overnight and it is now ready to serve. They will harden as the days go by. I suggest you consume them within a week. How much would it be to order some? They look delicious and very beautiful! Well it depends. I'd only be able to make them for pick-up in Melbourne. If you're really interested, you can leave your email and I'll contact you further. I'd say it was a success too! I'm so impressed! I could never do this! Way to go! Wow, I'm so impressed! They are gorgeous, you did a beautiful job. 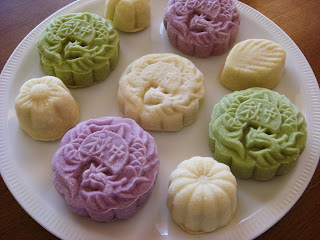 Awesome!~ I was actually thinking of making my own mooncakes this year! And it is true that some traditional mooncakes are a bit rich, but then, what is cheesecake? I have tasted some that don't taste like lard though..give them another chance? Hi, I'm in Melbourne too. Would like to know where you purchase the paste for the filling, wheat starch (tang mien flour) & fried glutinous rice flour (koh fun) from? Hi Serene, all of those products should be available at an Asian Grocer. I bought everything from KFL. The flours are in the one isle and the various pastes are in the isle with the canned foods and near the kaya jam! I hope this helps! I'm making my mooncakes tomorrow! :) Yay! Thanks for your reply. I manage to find all the products in boxhill although i had to go to a few stores to get them all. Did you have trouble unmoulding the snowskin mooncake using the jelly mould? It is hard to remove, but if you dust it with extra flour and be careful, it should be okay. I haven't really used the jelly mould much to make them.